Available in two other colors (blue and yellow), the Pink Cream Egg Bubbleroon is a nourishing, spearmint-infused bubble bar. Aside from providing a gorgeous heap of pink bubbles to your bath water, the bubbleroon softens the skin with rich cocoa and shea butter. To use, simply crumble under running hot water and watch as it turns the water pink. With the same key ingredients (cocoa butter, shea butter, and spearmint oil) as the Pink Cream Egg, this is simply a blue version of the same bubbleroon that will turn your bath blue. Also available in a "stripes" version, this is a large pink and yellow bath bomb egg that you can literally crack against your bathtub to release the baby chick inside (see photo below). The bomb has a sweet and citrus scent thanks to its grapefruit oil, Sicilian lemon oil, and vanilla absolute. To use, pop into a filled tub and watch as the bomb fizzes away into a soft swirl of yellow and pink. 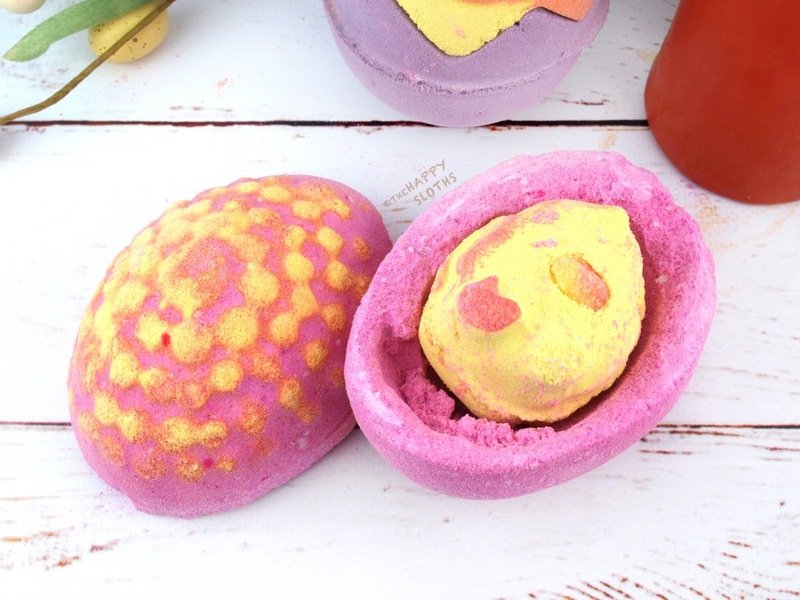 Neatly split in half (just like a cracked egg) to be used for two separate baths or one epic soak, this is a jumbo bath bomb shaped like a cute chick. Available in two other colors (purple and blue), the Orange Free Ranger is scented with bergamot, blackcurrant, and cypress. Thanks to the added coconut oil and sunflower oil, the bomb also provides some extra hydration to the skin. Probably my favorite item from this year's Easter collection, April Showers is an adorable cloud-shaped bath bomb embedded with little raindrops of nourishing cocoa butter. Thanks to the cedarwood oil, violet absolute, cypress oil, and tonka absolute, this bomb provides the most comforting and mesmerizing scent. Unlike most Lush bath bombs which I find to be too mild in scent, this one actually fills the bath with a sweet woody fragrance that lingers for the full duration of the bath. Additionally, the beautiful pink and purple raindrops give the water a magical swirl of shimmery colors. Made with St. John's wort (a potent antioxidant), shea butter, and organic avocado oil, Here Comes the Sun is a brightly-colored, packaging-free shower cleansing bar. Infused with mandarin orange oil, tangerine oil, bergamot oil, and fresh orange juice, the solid shower cream has a soft and refreshing citrus scent. The formulation provides a nice lather and the skin is left feeling supple and hydrated. Shaped like a curious little coy, this is a colorful bubble bar infused with a warm and spicy mix of black pepper, cinnamon, oakmoss, and neroli. When crumbled under running hot water, the bar gives the bath a bright orange color and a fun blanket of foamy bubbles. Literally molded around a wooden spindle, this is a mini reusable bubble bar inspired by the fidget spinner craze. Scented with bergamot, litsea, and benzoin, this bubble bar can be spun underwater to add a splash of bright yellow and soft bubbles to your bath. 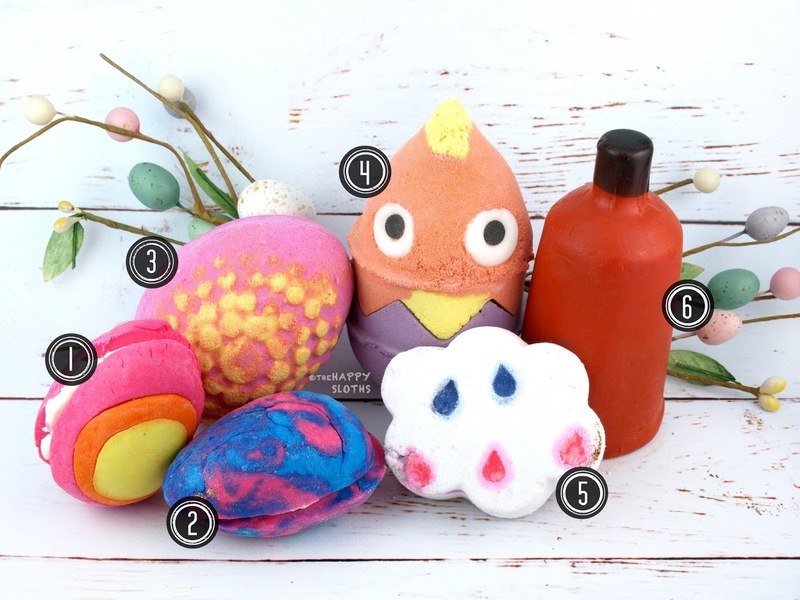 The price definitely works out to be more expensive in comparison to the other Lush Bubble Bars but it's still worth a try if you want to embrace your childish instincts. A classic Lush Easter favorite, the Golden Egg is a nourishing bath melt made with fair trade cocoa butter and olive oil. Infused with a gorgeous scent of Brazillian orange, bergamot, and gardenia, the egg is dipped in a generous coating of plastic-free gold glitter. It gives the bath a soft orange color and a mesmerizing swirl of shimmers. The clean-up does get a little messy but trust me, it's worth it! 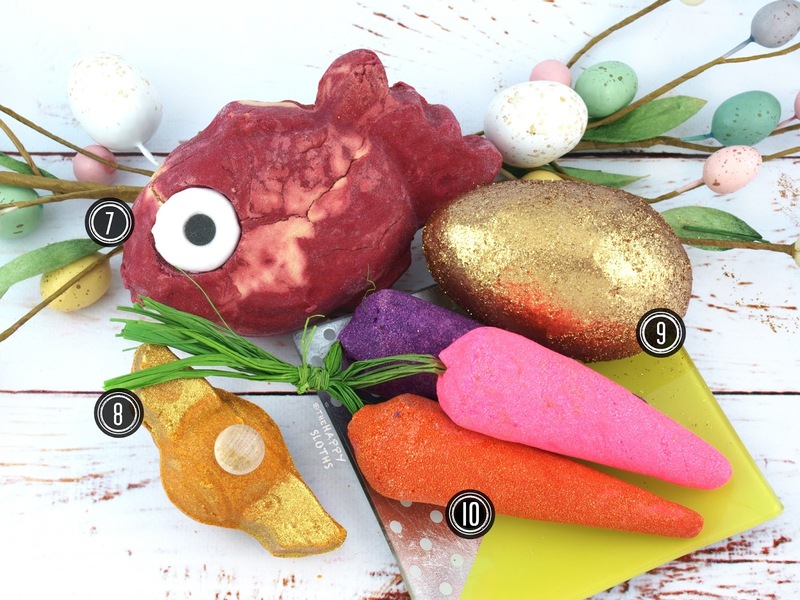 Another Easter veteran from Lush, the Bunch of Carrots is a trio of reusable bubble bars molded into the shape of some fresh-out-of-the-soil carrots. Infused with the refreshing scent of buchu oil, Sicilian lemon oil, and bergamot oil, the carrots give the bath a nice bed of voluminous bubbles. 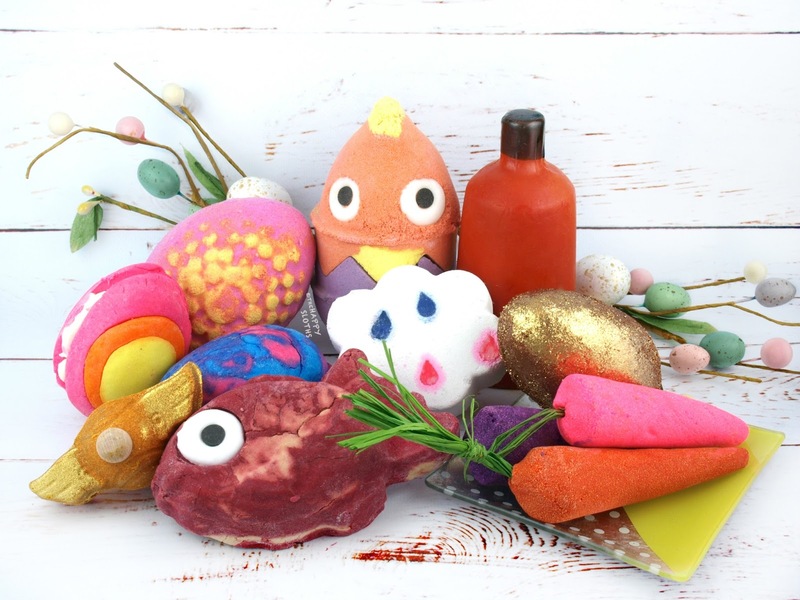 Have you spotted the Lush Easter Collection in stores yet? Will you be picking up any of the pieces? Share with me in the comments below!